Gladstone’s Library is committed to improving international public access to all its collections and events. For several years now, the Library has hosted audio recordings of many events, maintained a blog, and improved the website and social media. Launched in 2018, Digital Gladstone is an umbrella term under which we can gather all the Library’s efforts to improve access to our online collections. The first major project of Digital Gladstone is externally funded by the Carnegie Corporation of New York. The three-year project began in January 2018 and will result in a fully-catalogued digital collection of 15,000 nineteenth-century manuscript letters and 5,390 annotated printed books. These will be partially transcribed and hosted online in a free-to-access delivery platform, making one of the world’s most significant Gladstonian collections available to all. The project builds on the work undertaken to create GladCat – part of our successful online catalog – and ensure that the online presence of Gladstone’s Library is as unique and distinctive as the physical institution. Digital Gladstone is a digitization project which will make a collection of international significance and relevance widely accessible for the first time and safeguard it for future generations of scholars, teachers and students. Gladstone’s Library was founded in Hawarden, North Wales in 1894 by William Gladstone, one of Britain’s greatest Prime Ministers. Not only was he a great statesman, he was also a voracious reader - a true Victorian polymath – who built up a vast collection of books at his home in Hawarden Castle. He wanted these books to be used by others after his death and decided to set up a library in Hawarden to house them. Today, Gladstone’s original donation of some 20,000 volumes remains at the heart of a world-renowned collection of some 200,000 printed items focusing on theology, history, politics, culture and literature from the nineteenth century to the present day. This unique collection is housed in a building recognized as one of Britain’s most important heritage buildings. It is Britain’s national memorial to Gladstone, its only Prime Ministerial library and its finest residential library. Within the world-renowned collection held at Gladstone’s Library are two special collections of particular international significance: the Manuscript Archive and the Gladstone Foundation Collection. Both are unique and irreplaceable in terms of their cultural and historical importance. The Manuscript Archive comprises approximately 300,000 documents of which around 15,000 relate directly to William Gladstone i.e. letters written by or to him and papers that pertain to crucial events in his own life and that of the British nation. With the support of the Carnegie Corporation of New York and the US Friends of Gladstone’s Library, the Library is undertaking a three-year project to digitize Gladstone’s correspondence and, when all legal and copyright issues have been addressed, make them available online. The Gladstone Foundation Collection comprises some 20,000 books which have been positively identified as belonging to William Gladstone because they bear his handwritten annotations and/or were listed by him in his diaries. Previous work undertaken on the Foundation Collection in 2006 in partnership with the University of Liverpool resulted in a dedicated catalog, GladCat, an electronic research resource which provides extensive searchable details of Gladstone’s annotations and marginalia. Work will be undertaken to enrich and update GladCat, making use of the latest technology so that the Gladstone Foundation Collection can be made more widely accessible as part of a full digital repository. Gladstone’s correspondence and the annotations in his books give the clearest possible insight into the mind of one of the greatest statesmen of the nineteenth century, a man whom Andrew Carnegie called ‘the world’s greatest citizen’. His forward-thinking on human rights, democracy and religious tolerance has much to teach us today. 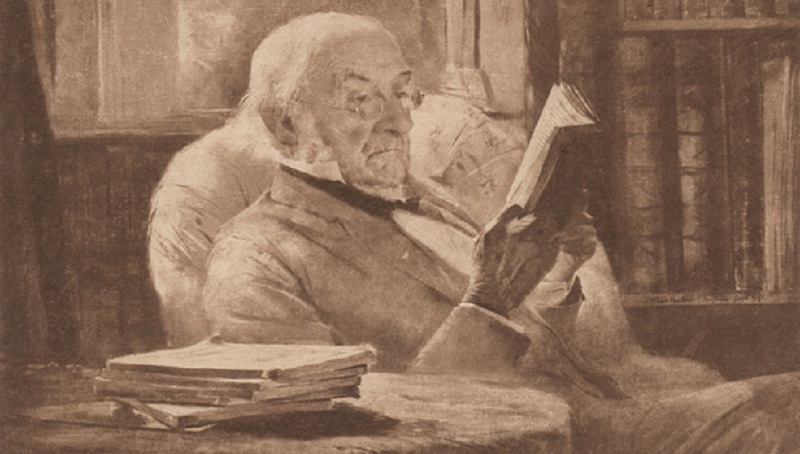 As well as being a leading politician on the world stage, William Gladstone was a devoted father and husband, who cherished the time he spent at home in Hawarden. His letters reveal intriguing details about an extremely broad range of issues from the family’s domestic life to the political campaign trail while marginalia in his books leave today’s readers in no doubt as to Gladstone’s thoughts on other political figures or issues of the day. Both books and letters offer an enormous wealth of as yet untapped primary source material which deserves to be accessible to all but will be of inestimable value to anyone studying the social or political history of the nineteenth century in particular. At the moment, the volunteer team is physically based at Gladstone's Library. However, we expect there to be opportunities in the future for remote transcription volunteers. Please email Elizabeth Fife-Faulkner (elizabeth.fife-faulkner@gladlib.org) to register your interest. A full program of public events and engagement activities will roll out from 2019. A symposium for digital and information professionals is planned for late 2019 and an academic conference for 2020. If you’d like more information, please email louisa.yates@gladlib.org. Digital Gladstone Open Days will also take place at the Library. There will be a number of free places for a visit to the digital studio, where visitors can learn how the digital process works and see some of the material being digitized. To register your interest in an Open Day place, please email elizabeth.fife-faulkner@gladlib.org. Digital Gladstone is looking for a content management system to host our newly-digitised collections. Interested parties should submit responses to the following brief by Friday, 23rd March 2019. Please direct enquiries to louisa.yates@gladlib.org. You can keep up-to-date with all of our project news by following the #digitalgladstone hashtag on Twitter and Facebook.